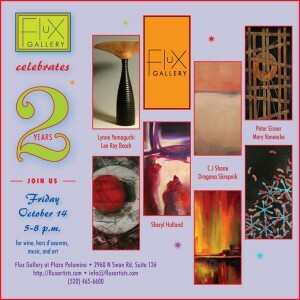 Please join us on Friday, October 14, from 5 to 8 p.m. to celebrate the second anniversary of Flux Gallery at Plaza Palomino. Enjoy wine, hors d’oeuvres, and new work by artists C.J. Shane, Dragana Skrepnik, Lee Roy Beach, Lynne Yamaguchi, Mary Vaneecke, Peter Eisner, and Sheryl Holland. Flux Gallery is located at Plaza Palomino, 2960 N Swan Rd (at the southeast corner of Swan and Ft Lowell), in Suite 136. For more information, see http://fluxartists.com, email info@fluxartists.com, or call (520) 465-6600.